Whether they are ready for it or not, IT Operations teams have the Internet of Things (IoT), including BYOD devices such as smart watches, added to their growing list of responsibilities. With employees bringing in potentially compromised devices holding malicious malware, it's time for enterprise IT to understand the environment and not just tick the security compliance box. On the other hand, IoT poses an opportunity for IT organizations to add significant value to the business by providing real-time operational intelligence and enterprise architecture. A new network monitoring approach called wire data analytics analyzes communications on the network to extract valuable IoT security, performance, and even operations data—and requires no agents! 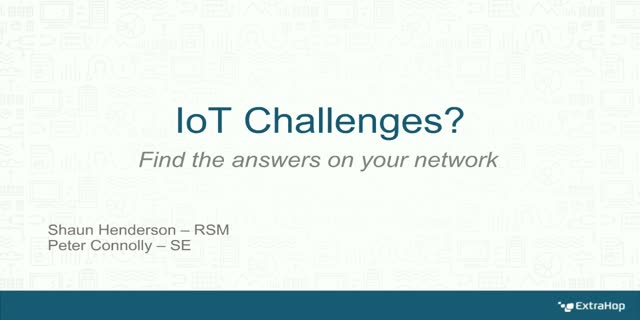 This webinar is ideal for any networking, architecture or security professional looking to improve visibility across their network, to reduce threats and vulnerabilities and especially those with a focus on the Internet of Things (IoT).